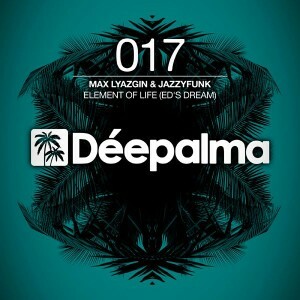 Deepalma Records proudly presents the next release 017, a collaboration between Russian whizz kid Max Lyazgin and Italian duo JazzyFunk. Max is no stranger in the biz anymore. His releases on top notch labels such as Nurvous, Spirit Soul, Kiez Beats, Indiana Tones or Tiefblau quickly brought him on the radar of the worldwide club scene. Now teaming up with Italian live duo JazzyFunk who haven’t released on less renowned labels including Sleezy Deep, Prison Entertainment or Street King has led to the wonderful song called Element of Life (Eds Dream) which is combining both a beautiful dreamy backing with an outstanding atmospheric vocal line. A true gem for the beaches of the world. It has written summer all over it.